Hi! I'm Angelica, and I'm an A.I. roboticist! I'm an Assistant Professor of Professional Practice in Computing Science at Simon Fraser University, building artificial intelligence software for robots to interact in a smart, but fun, way. Ever since I was little, I imagined robots as kind and compassionate. I wondered: "Could a robot have feelings?" and "How would that even work?" My research addresses this question by combining neuroscience, machine learning and developmental psychology. I have a Ph.D. and M.Sc. in Computer Science from Kyoto University, Japan, specializing in AI applied to Robotics, and a B.Sc. in Computing Science (specializing in Artificial Intelligence) from Simon Fraser University in Canada. 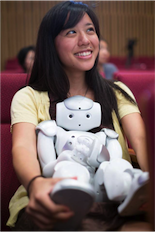 I'm also a writer for the robotics online magazine IEEE Spectrum Automaton. My previous work includes: a robot that plays music in a human ensemble, a robot that speaks and gestures with emotion, a robot that recognizes emotion in dynamics, and some exploratory robots for land and sea. Feel free to take a look around! Keywords: robotics, artificial emotion, human-robot interaction, signal processing, multimodal gesture recognition, machine learning, SIRE emotion model, affective computing, entertainment robotics. Contact me at hello[at]angelicalim.com, or find me on Twitter, my PetiteGeek blog, Google Plus or Google Scholar!